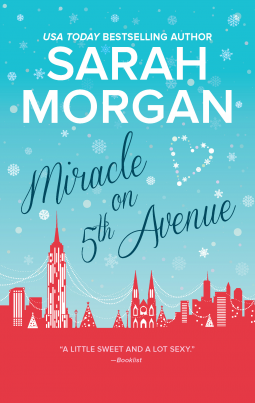 With Miracle on 5th Avenue – we have #3 in the From Manhattan with Love series. It’s a story I have been anticipating with relish for awhile now, and so it was a pleasure to read about Eva and Lucas Blade. We’d met Eva before and knew her pretty well but Lucas was a treat in store for us. They’re both suffering loss, yet Eva has no one – no family at all, although what she hasn’t taken time to realise is that family doesn’t always have to be blood based. Her many close and not so close friends both adore and love her. Lucas is trying to escape his interfering family (as he sees it). So while he is pretending to be in Vermont he is actually at home. He is a writer with writer’s block, the book is due and there is not a word on the page, until enter Eva – sent by his Grandmother to decorate and cook so the place is all welcoming when he returns for Vermont. So this book is a slightly different version of meeting and being snowed in, because of course Lucas was home when Eva turned up, but it was too icy and snowy to leave. Eva is a romantic, she believes in love and living happily, even ever after. Lucas has past experience that tells him differently. Eva doesn’t like the dark thrillers that Lucas writes and would love to see a little love in there to lighten things a little. That horrifies Lucas! So there is a fun clash between the two, some tension and heat, and possibly coming up a love story and a happily ever after. I enjoyed Eva and Lucas’ story and it ends deliciously. Can’t ask for more. I liked this one but thought Eva was too perfect. Maybe I wouldn't feel that way if I'd read the earlier books in the series. I will have to check those out too. Nice review! This sounds like such a cute read perfect for the kind of reading the cold weather brings on. I love a good cozy romance in December. I love when characters clash but end up loving each other anyway. How delightful! The setting is perfect for a holiday romance. But with resistance, of course, since the author must write! It certainly can be read as as a stand alone Rita, I should have mentioned that. It was a treat for me too Kathryn! Sounds like a fun read, and light and breezy enough to read during busy holiday time. Probably it can be treated as a standalone for those of us who haven't read the previous ones. That sounds like a sweet book for the cold winter months. Lovely review!